V.I.P. 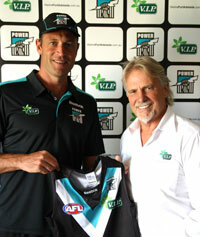 Home Services has signed on as a Joint Major Partner of the Port Adelaide Football Club. In 2011, V.I.P. was a Premier Partner for the Port Adelaide Football Club when it was the coaches’ sponsor. As a passionate fan of the Port Adelaide Football Club, Mr Bill Vis, founder of V.I.P Home Services is thrilled the partnership has grown from being a Premier Partner to a Joint Major Partner. “It’s thanks to the great results we have seen from the partnership and the fantastic relationships we have with the club that increasing the sponsorship was an easy decision,” said Mr Vis. “To be partnering with a club that shares similar values and is the only club to be playing in every AFL market in 2012 makes sense from a business and brand exposure perspective. We welcome the club wholeheartedly to the V.I.P. family.